VIP E Cig is one of the most recognisable vaping brands in the UK and their many flavoured cartomizer refills make it easy for even more people to enjoy a range of different vape flavours. Each VIP Cartomizer Refill Pack has five individual cartridges and is compatible with the VIP Starter Kit. 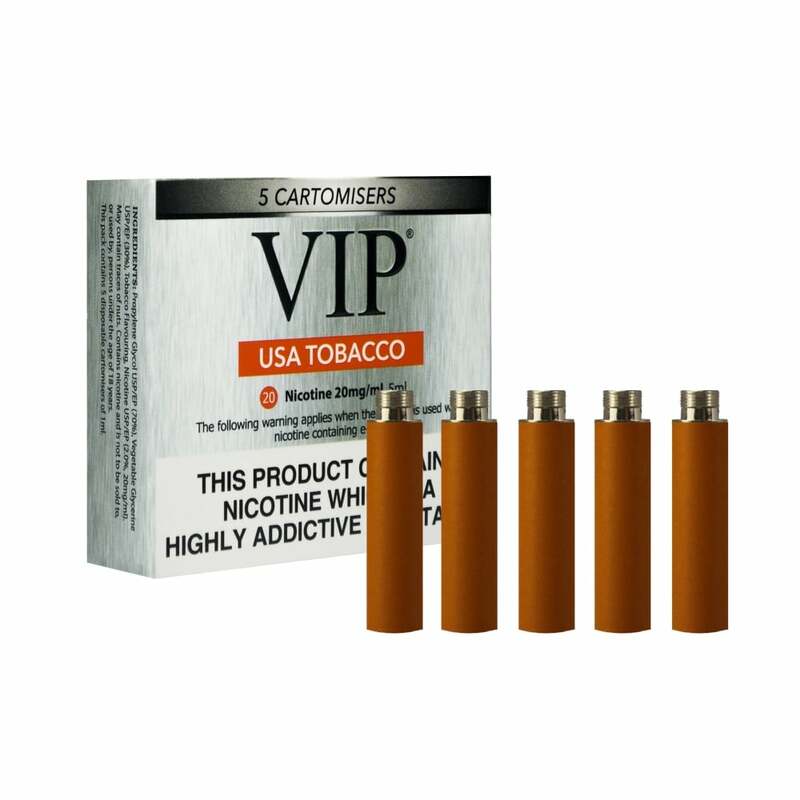 Enjoy your USA Tobacco VIP E Cig Refills in a nicotine level of your choice. The authentic tobacco taste balances smoothness with strength and each cartomizer screws onto the end of your VIP E Cig battery effortlessly. I have tried quite a few types of cartomizers without success. This cartomizers strength and flavour has a good hit to the back of the throat which is cigarette like without the dangers cigarettes bring. I can totally recommend this cartomizer. therefor didn't work, don't know if anyone else has experienced this problem. First time l've used the internet to purchase these ecig's it was easy to navigate the site very pleased with the savings on multi buys and the cartomisers were exactly what I wanted. Perfect for me, just what i need. I have reduced the strength to 11 now and I am coping with this very well. Great ,never going back to cigarettes after smoking these. An excellent product at a competitive price . I would strongly recommend this product to other e-cigarette users. I have tried others and I write this one the best on the market . Great product, well made . Lasts longer than you think.